Brain Worm Farm: Who Let the Cat out of the Bag? Idioms, sayings, turn of phrase or maxim no matter what you call it these are clearly the rare spices which season a language and make the otherwise dry syntax go down smooth as honey. Some idioms are difficult to pin down to a specific historical and cultural time frame. We rely on the first instance when the idiom was found in print in order to date its inception into the common lexicon. Of course this isn't the first usage but it is the first documented in a primary source. The Brothers Grimm didn't suddenly happen upon German Faerie tales in the 19th century. Those tales had been told for eons and the Brothers Grimm had the foresight to preserve them for generations to come. The specific idiom, “pig in a poke” is one which is extremely difficult to fit into a specific time of origin. We know that is was a common phrase in Medieval Europe. The idiom is derived from, by modern standards of grifting, a rather primitive medieval con. 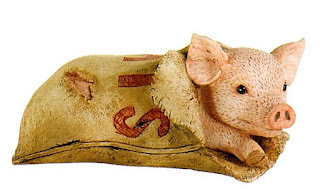 Meat was scarce and expensive commodity in the middle ages so the chance of snagging a cheap savory piglet at the market was pounced on immediately. The con artist never missed his mark and realized that the weight and feel of a presumably shaved cat or puppy would go unnoticed by a famished rube. Despite being a last resort meal (dog and cat meat by no means the meat of choice), “pet food” was sometimes begrudgingly eaten. The Dutch have a colorful and historically interesting phrase which probably casts light on the state of urban malnutrition during the middle ages. The Dutch euphemistically refer to cats as “Dakhaas” or “roof hare” in English. Back to the trickery. The “con” was orchestrated by a “grifter” out of a “Monty Store” probably in cahoots with a “shill” who boisterously lured the “marks” out of the crowd to step closer and have a look at the wares. The conman sold the “pet” to the gullible rube who thought he was buying a juicy piglet but in actuality got stuck with a cat or perhaps a hare instead. Undoubtedly, the con couldn't be sustained all day so some kind of exit strategy was employed to either disperse the crowd or make a speedy retreat when the money was sufficient enough to split; called a “blow off” in the con and hustle pidgin of thieves. The idiom gives rise to another idiom “letting the cat out of the bag” in English. Letting the cat out of the bag alludes to the “Tell” which is the act of exposing the con by showing its dubious contents. A curious observation is that while most European languages have an nearly verbatim equivalent to the idiom “a cat in the bag” a few languages reference a different animal entirely. For example, English uses a pig (poque being a French loan word meaning pocket or bag), Czech uses hare, Estonian use piglet, Eire uses pig, Finnish uses pig and Swedish also uses pig. This is interesting not only because I can geek out for hours on the evolution of European semantics, but also because of the geographic locations of countries as well as their similar philology. Why does Czech have a hare in the sack while Slovakian puts a cat in the sack? Enjoy your brain worm.